In a large bowl, combine mashed banana, 1 3/4 cup milk, eggs, ricotta, and lemon juice; whisk until smooth. Drizzle in melted butter, stir. In a small bowl combine 1 cup ricotta, 1-8 oz block of cream cheese (softened), 1/4- 1/2 cup honey (depending on how sweet you want your cream), 2 T milk, dash of vanilla. 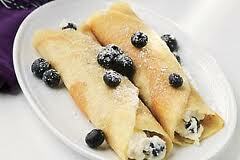 Mix well, fill crepe with about 2 T of cream mixture, adding more berries before folding/serving.